GAP Sales has partnered with Corecentric Solutions to provide discontinued or hard to find electronic controls. If you are searching for a discontinued control, we can have your defective original control rebuilt to better-than-new condition, with a fast turnaround, and include a 1-year 100% satisfaction guarantee on your purchase. We can usually have your part reconditioned within a 2-3 day window. Controls are thoroughly tested and improvements in design are included for better than new performance. Please contact us with any questions. 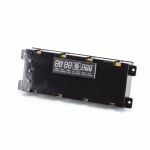 211708 DCS Range Oven Digital Display Unit. Fits DCS models: WO-130SS 236881 WO-130SS-PH 236882 WO-130SS-PH-BR. PLEASE NOTE! THIS PURCHASE REQUIRES YOU TO SEND IN YOUR DEFECTIVE CONTROL FOR REPAIR. If we receive your control and it is deemed beyond repair, we will notify you to determine whether or not you want us to return the control to you. WE WILL REFUND 100% of your purchase. 316418721-RFR Electrolux Frigidaire Range EEC Control. Replaces AP3783904, 1064465, AH977999, EA977999, PS977999. Click MORE DETAILS link for specific model coverage. PLEASE NOTE! THIS ITEM IS NO LONGER AVAILABLE FROM THE MANUFACTURER. THIS PURCHASE REQUIRES YOU TO SEND IN YOUR DEFECTIVE CONTROL FOR REPAIR. 3360629R Whirlpool Washer Transmission Gearcase. Fully remanufactured by Corecentric Solutions. Full ONE YEAR warranty. FREE GROUND SHIPPING to lower 48 states. Replaces AP3096209, WP8546456, WP62621, 8546456, 62621, W10172898, 285312, 3349296, 3360629, 3360630, 388763, 389244, 389246, 3949609, 423, 62534, 62680, 63320, 63563, 63910, 8532118, AH341974, EA341974, PS341974, B00DM8JSDC. Machine control board for Fisher & Paykel GWL10US washers. 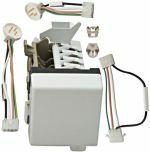 4317943R Replacement for Whirlpool Universal 8 Cube Icemaker Kit. SAVE MONEY WITH THIS QUALITY REMANUFACTURED ICEMAKER. We remove original coating and replace with a more durable coating that resists peeling. One year warranty included. Replaces part numbers: AP2984633, 1857, 4210317, 4211173, 480616, 480617, 482014, 482015, 482016, 482017, 482018, 482019, 482020, 482394, 482433, 482990, 625601, 625603, 625610, 625611, 625622, 625625, 625653, 625656, 625660, 626002, 626201, 626237, 626366, 626461, 626489, 626608, 626609, 626626, 626636, 626670, 626687, 627572, 68972-4, 797991, 8114, 833701, 978552, 978553, 978556, AH358591, EA358591, J21791, J22241, PS358591, W10122496, W10190952, W10281545. 6871W1S019A LG Microwave Control Board RFR. Replaces AP4457489. 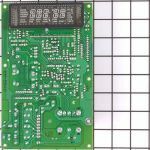 8185278-RFR Kitchen Aid Microwave Oven Control Board. Replaces AP3179871, 4359017, 4359018, 4359238, 4359607, 8172100, 8184882. WP8546219R Whirlpool Dryer Electronic Control Board. Replaces 8557308, 8546219EXCR, 661653, 3978918, 3978889, 3978917, 3980062, 1060737, AH973725, EA973725, PS973725, 8557308R, 3980062R, 8546219R, 3978918R. Fits several models. Click MORE DETAILS link for specific model coverage. THIS REMANUFACTURED CONTROL CARRIES A ONE YEAR WARRANTY. 92028R Dacor Range Oven Relay PCB Board. Replaces AP3851203, 82995, 82127, 740533. Remanufactured by Corecentric Solutions. 1 Year Warranty. WPW10189966 Corecentric Whirlpool Cabrio Oasis Washer Motor Control Board. 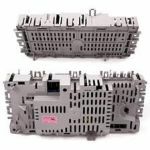 Replaces AP6016601, W10189966, 8576385, 8576386, PS11749893, W10051171, W10051176, W10104820, W10104830, W10112111, W10112112, W10112113, W10121311, W10121508, W10130544, W10155109, W10188476, W10201186, WPW10189966VP, B004TESASW, B008DK5ZQI, B001DPP8D0, B00GO0XXQ8, B008DJNIY0, B001KGYMSE, B005B5RXL8, B001EYCVV2, B00LLMS7NS, B008DJNHWI, B008DJMBYI, B008DJHGBG, B008DJOBGO, B008DK601C, B001DPOZES, B008DJHWME, B008DJHWX8. Fits several models of Whirlpool Cabrio series Washing machines. Click MORE DETAILS link for specific model coverage. Typically when these washers display F1, this is the part that needs to be replaced. WB27K5053 General Electric Range Oven Control RFR. Replaces AP2632540, 335647, 336282, 336327, 336328, 337178, 337179, 338894, 339187, 339188, 340453, 343557, 4337723, 4337741, 4337742, 4337979, 4338512, 4342559, 4342561. PLEASE NOTE! THIS ITEM IS NO LONGER AVAILABLE FROM THE MANUFACTURER. THIS PURCHASE REQUIRES YOU TO SEND IN YOUR DEFECTIVE CONTROL FOR REPAIR. Click for more details. WP3953248R Sears Kenmore Washer Timer. Replaces AP6008926, 3953248, 3953248R, PS11742067. REMANUFACTURED OEM PART. WPW10503278CR Whirlpool Refrigerator Control Jazz Board. Replaces: 12784415 , AP5657149, AP4366538, PS11755733, PS2344409 W10165748, 8208187, 67006740, 67006712, 67006226, 67006216, 67006214, 67006209, 67006034, 67005281, 67005280, 67005043, 67004907, 67004496, 67004453, 67003867, 12868510, 12868502, 12868513 12784415V, 12002706, 12002567, 12002509, 12002508, 12002449, 12002445, 12002339 . Click MORE DETAILS link for specific model coverage. THIS IS A REMANUFACTURED CONTROL WITH FULL 1-YEAR WARRANTY. PRICE INCLUDES CORE CHARGE. RETURN YOUR DEFECTIVE CONTROL FOR $10.00 CREDIT. THESE PARTS ARE BETTER THAN NEW. OPTIONAL 3-YEAR WARRANTY ONLY $20.00 EXTRA! WR55X10942CR Replacement for WR55X10942 GE Refrigerator Main Control Motherboard. Replaces 1531075, AH2364946, EA2364946, PS2364946. Fits most electronic control models without inverter compressor. Click MORE DETAILS link for specific model coverage. THIS IS A REMANUFACTURED CONTROL WITH FULL ONE-YEAR WARRANTY. OPTIONAL 3-YEAR WARRANTY ONLY $20.00 EXTRA!